Phantasmagorical frights that morph and stretch as they fight. Stay locked on, and all the fancy footwork in the world won't save them. As tough as they are to predict, there are moments when they just sort of...stand there. And when they space? Keyblade to the face. "We have come for you, my liege." The Dusk is a low-ranking Nobody that is found in Kingdom Hearts II and Kingdom Hearts 358/2 Days. Dusks are the most common Nobodies. They are the only types of low Nobody known to be able to speak, and are used by Organization XIII for simple recon and courier operations. Higher-ranking Nobodies are sometimes threatened with being transformed into Dusks as an extreme form of punishment. Dusks are sent into the Simulated Twilight Town to bring back Roxas, but due to DiZ wiping his memory of his time in the Organization, Roxas instead fights them off along with several Creepers and Twilight Thorn. One Dusk poses as the virtual Vivi, summoning its comrades when the Struggle match freezes. Yen Sid later shows three Dusks holograms when explaining the existence of Nobodies to Sora, Donald, and Goofy. During the Battle of the 1000 Heartless, Dusk fight against Armored Knight Heartless. However, once Maleficent orders them to focus on Sora, Donald and Goofy, the Dusks team up with them. Saïx summons some Dusks to take out a small battalion of Soldiers summoned by Maleficent. They then pin Maleficent to the ground, forcing her to flee through a Corridor of Darkness. In The World That Never Was, Dusks and a Neoshadow attempt to prevent King Mickey from advancing up Naught's Skyway. He slays them all to save DiZ. A Dusk has a thin, sinuous body that is capable of dumbfounding feats of flexibility. It has a large, cylindrical head with a flat top that is emblazoned with the Nobody symbol. 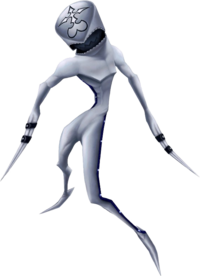 Its body seems to be covered in a light grey jumpsuit, and its "mouth" is actually a zipper that undoes itself to reveal its actual, grey, sharp-toothed mouth underneath. It appears to be fairly muscular, though its arms and legs are very thin. The sides of its body are lined by a black line, which pulses weakly with light. Its feet and hands are pointed and lack digits, and its hands each sport two black bands around them. The Dusk's name refers to the period of time when the sun begins to set and twilight begins to set in. This emphasizes how Nobodies are beings of neither Light nor Darkness, but are closer to the Darkness. Dusks are fairly weak and require little strategy, but can be a bit troublesome in large groups at the beginning of the game, especially when paired with the Creeper Nobody. The Reversal reaction command can help as it stuns the Dusk and any surrounding Dusks and Creepers. However, although this strategy works well playing as Roxas (because of the shorter combos), when at high levels they can eliminated with ease. Reversal can also be used to avoid other Nobodies as they normally appear with others. Also fire magic and thunder magic can help greatly when playing as Sora in case they surround him. Dusks can also be battled in Kingdom Hearts 358/2 Days during several missions located in The World That Never Was. Dusks appear to be very mischievous, drawing on Roxas's face with markers during his early days in Organization XIII, and when he fell into a coma, making him look like Groucho Marx on Day 29, and Xigbar on Day 30. Afterwards, Xion would clean his face daily, but this only prompted them to draw in permanent marker. They also seem to perform servitude roles for the other members of the Organization, such as giving Xaldin a shave. Dusks are the first common enemy to be specifically mentioned outside of Jiminy's Journal; in this case, they are referred to as such by Axel and Yen Sid. A glitch in the North American Kingdom Hearts II causes a Dusk to randomly pop out of one summoned by Axel while it is being fought.